Shivji Jha: Our Google has CHANGED !!! But is it Evil ??? Have you seen something like this on the google home page recently?? If you have, congrats you are aware of the issue and i would love to have your views. 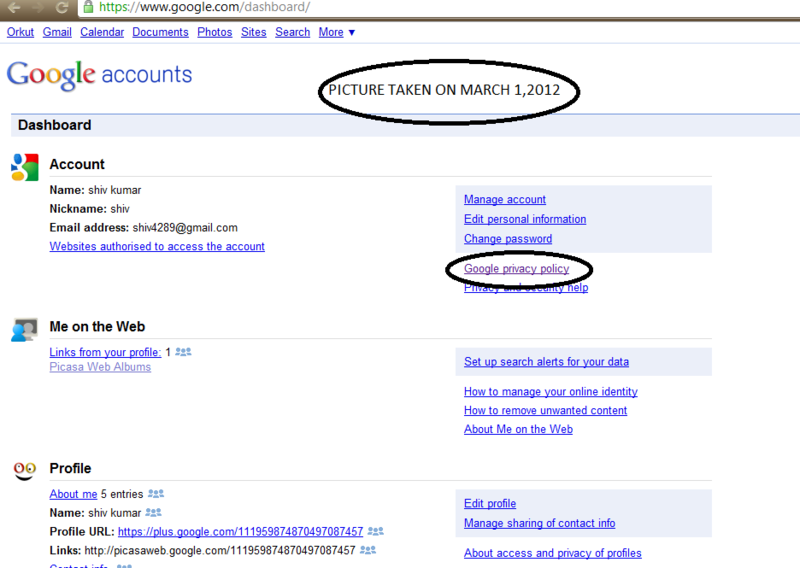 If not, let me inform you that Google is going to make a few changes today(march 1, 2012). But does it matter ?? Should you bother ?? Probably, that is what I want to discuss with you - whether it matters or not ?? Let me first mention what is going to change after all. If you are aware of the policy changes, you may skip the next section. Whats the fuss about ?? Have you ever looked at your google dashboard ?? I have got a picture for you from mine. 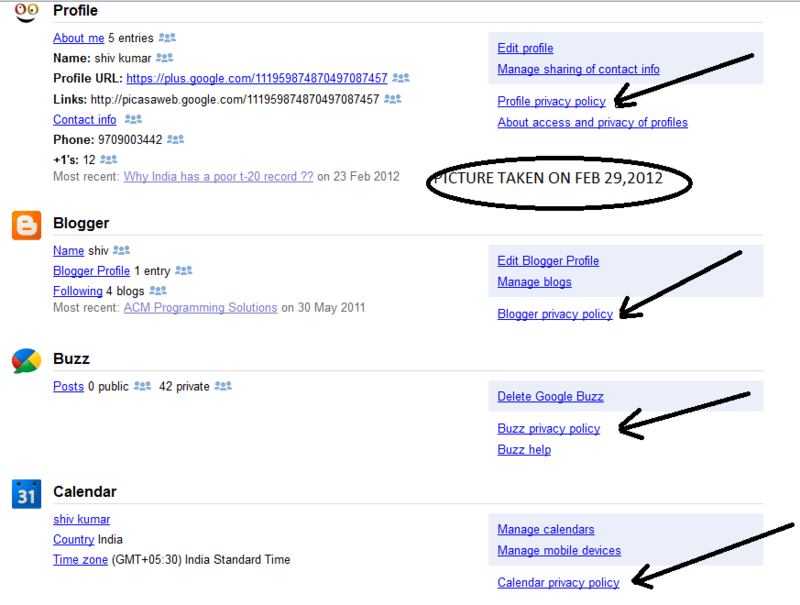 Look at the picture below (taken on FEB 29,2012) and try following the arrows. Make it easier to understand how it uses your data because you have to read only one page to understand how google collects and uses the information about you. Still confused ? Do you have a question ? If yes, turn to the google's FAQ section on privacy . Lets now get a little further and interpret this. When you do a Google search your results will be personalized for you. Suppose one visits a particular web site often, or if his friends have shared a link, those are personal signals that can be used to reward a listing and cause it to rank better(to understand the ranking better visit my previous post). Sounds kind of good, right ?? Then why all this blah-blah ?? Looka at the next section now. Why NOT a welcome change ?? Lets now think the other way. People these days leave a lot of information on the social networking sites. These too are pieces of information and is that not exactly what Google is supposed to do ? Process information everywhere and find the most valuable ones . Now everywhere means the social networking sites too. But then Facebook and twitter which share a good share of social networking dont allow Google to extract your info you provided them or from that matter whatever you scribble there . In that case what does Google do ? Use only Google+ to find that kind of information. Now that sounds interesting, Right?? If yes, thats what my aim was - to make you think if this is for good or bad ? Whats my take - Evil or not Evil ? Let me first tell you that I am a big fan of Google products specially Gtalk (I think Gtalk is just too smooth and error free too. Isnt it ?). I agree that Facebook and Twitter not being apat of Google's search for social info (only Google + is) is a big setback but how is Google to be blamed for that ?? And when Google planned to include this sort of information into your web search results, it did ask twitter to let them access their info about people but it was Twitter that disagreed. I am not very sure about Facebook though. You would now say that Google will know too much about me implemeting this streamlining of all data. To that, Iwill just answer that Google always had a lot of info about you. Its been that way since day one. If you just search a lot on Google, Google knows a good deal about what interests you. So what! If you use any Internet service or Web site a lot they know a lot about you. Add to it that Google lets you manage this info through its dashboard as well (visit this Youtube link to know about Google Dashboard). If you dont like the fact that Google tracks your web search historygo to your Google Web History page and hit the pause button, and then choose “Remove all Web history.” and you’re done with it. Rather, if you are not signed in , it is quite probable that you wont get the information from Google+ appearing at the top of your search results. Finally to the people who clam that Google knows more about one's wife than he himself does (a very popular quote, have seen this a lot on web during my research for this post:D) , once you are on web, there is always a chance that you can be tracked. You have to trust someone, I choose to trust Google. Do you ? Of all the articles I read , this one one stood out. And you can probably find that influence in my post too. I would suggest you to go through the article. Its really good ! !